Hidden Creek is a 55+ community located in Sebring, Florida. Hidden Creek offers active adult homebuyers low-maintenance attached and single-family homes available on a resale-only basis. Residents of Hidden Creek also enjoy a charming clubhouse and social activities that allow neighbors to become lifelong friends. This active adult neighborhood provides homeowners a small and quiet setting, yet close to many everyday conveniences and attractions within the area. The clubhouse at Hidden Creek is the central hub of social activities and physical recreation. Residents can stay in shape by utilizing the exercise room. They can gather with neighbors in the multi-purpose room to play cards, games, and billiards or just enjoy a casual conversation over a cup of coffee. Homeowners can find peace and quiet in the library so they can read their favorite novel. A catering kitchen is on hand for preparing snacks for a community party or event. Hidden Creek also provides great outdoor amenities for its residents. 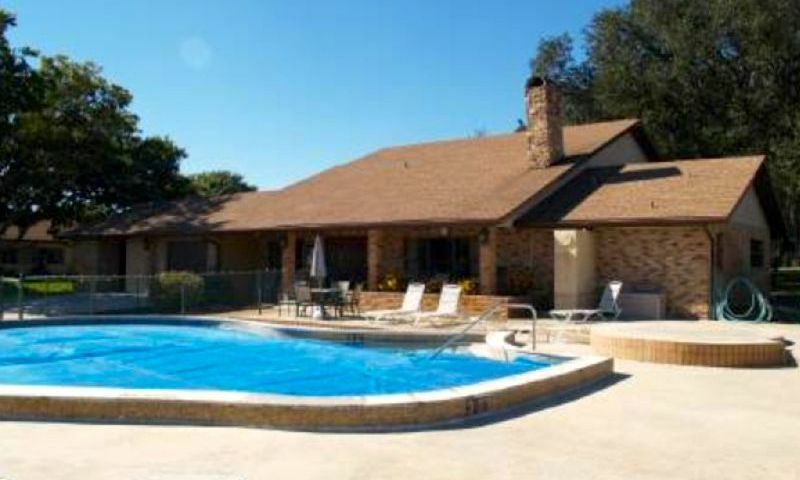 They can swim in the heated pool, soak in the spa, or relax on the patio. Homeowners who want a bit more activity can challenge a neighbor at the shuffleboard courts. The neighborhood is surrounded with walking and biking trails, which allow active adults to take leisurely strolls on a beautiful day for some fresh air. Hidden Creek was developed between 1986 and 2007 with about 55 residences. This active adult community offers attached and single-family homes on a resale-only basis. The majority of homes feature vaulted ceilings, open layouts, tile flooring, covered lanais, and backyard patio spaces. Some homes have updated features like kitchen cabinets, countertops, and hardwood laminate flooring. All residences in Hidden Creek are low-maintenance, which are perfect for the active adult homebuyer. Attached homes range in size from approximately 1,062 to 1,771 square feet of living space. They have two bedrooms, two bathrooms, and an attached one-car garage. Single-family homes in Hidden Creek offer main-floor living. These detached homes range in size from approximately 1,115 to 1,869 square feet of living space. They have two or three bedrooms, two bathrooms, and an attached one or two-car garage. Residents living in Hidden Creek enjoy a maintenance-free lifestyle. The homeowners' association (HOA) fee covers lawn care, access to the clubhouse and amenities, and pool maintenance. Thanks to the HOA, active adults of Hidden Creek have more time to enjoy this social environment that offers activities and events that keep them entertained all year long. Some of the activities include socials, potluck dinners, Monday morning coffee, water aerobics, billiards, and swimming. Hidden Creek is ideally located in Sebring, Florida. Residents have easy access to U.S. Highway 27 and Sebring Parkway so getting to other parts of town is a breeze. There are plenty of restaurants and shopping nearby, such as a Walmart Supercenter, The Home Depot, Lowe's Home Improvement, Starbucks, Olive Garden, and Lakeshore Mall. Outdoor recreation at Lake Jackson is only four minutes away. Lake Jackson is a great area for relaxing on the beach, having a picnic, or boating. Highlands Hammock State Park is another great outdoor attraction for camping and wildlife activities. Homeowners can drive to Avon Park or Lake Placid and see all these cities have to offer in less than 30 minutes. Sebring Regional Airport is about 20 minutes away for residents who need to travel a bit farther. Hidden Creek in Highlands County, Florida is a quiet 55+ neighborhood with so much to offer in and around the area to active adult homebuyers. There are plenty of activities available in Hidden Creek. Here is a sample of some of the clubs, activities and classes offered here. Attached homes in Hidden Creek range in size from approximately 1,062 to 1,771 square feet of living space. They have two bedrooms, two bathrooms, and an attached one-car garage. Please Note: Floor plans are not available at this time. Single-family homes in Hidden Creek offer main-floor living that's perfect for the active adult homebuyer. These detached homes range in size from approximately 1,115 to 1,869 square feet of living space. They have two or three bedrooms, two bathrooms, and an attached one or two-car garage. Please Note: Floor plans are not available at this time. 55places.com is not affiliated with the developer(s) or homeowners association of Hidden Creek. The information you submit is distributed to a 55places.com Partner Agent, who is a licensed real estate agent. The information regarding Hidden Creek has not been verified or approved by the developer or homeowners association. Please verify all information prior to purchasing. 55places.com is not responsible for any errors regarding the information displayed on this website.